Is 15 Inches Too Long? Perhaps. More on that later. After talking with the guys at AP Industries about their carbon fiber handguards, I ordered one for a ‘special project’. The 15 inch ‘Tactical’ model to be exact, because I want the full length top rail for mounting iron sights. The Tactical models also come with a couple of 2″ picatinny rails that can be mounted to any of the vents in the handguard. Those will be put to use later. New 15″ Tactical Handguard from AP Custom USA. 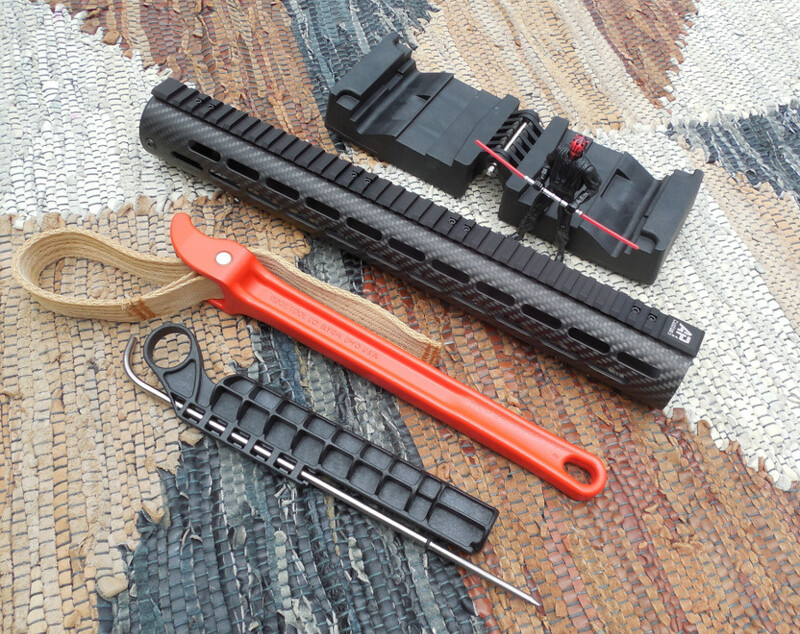 I had not attempted this type of project before [I’m not a gunsmith] and because I wanted to learn how to change out handguards / build AR upper receivers, I set about collecting the necessary tools. The project upper was sporting a Hogue free float tube so I needed a strap wrench to remove it. 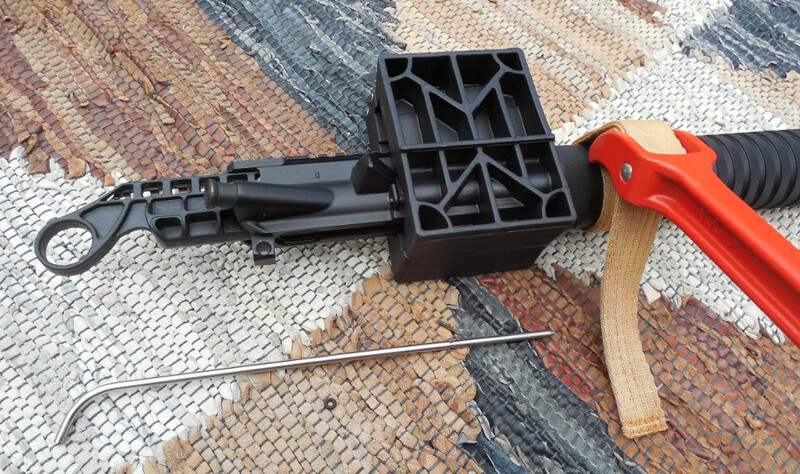 The upper receiver vise block I chose is by Wheeler Engineering and includes a very clever gas port alignment tool. To install the new AP Customs handguard I needed a barrel nut wrench and a barrel nut. Also required, but thankfully already owned, are a T15 Torx driver, a 1/2″ socket wrench handle, Blue Loctite, and a big honking vise. Disclaimer: I am not a gunsmith. This article does not constitute instruction. I’m not responsible for damage to you or your gun if you don’t seek out qualified instruction elsewhere. I’ll leave it up to you to figure out how to remove muzzle devices, gas blocks, gas tubes, etc. Parts of the AP Custom handguard attachment system shown aligned in ‘exploded’ view. 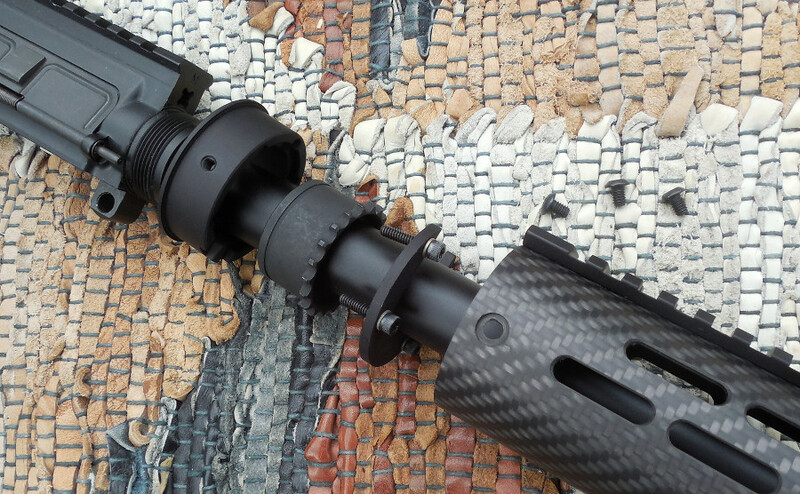 Milspec barrel nut is NOT included with handguard. These forum posts have more pictures if you are curious. I cinched everything up using the highly technical method of turning the barrel nut to ‘hand tight’ and then using the barrel nut wrench to tighten it just enough until the nearest barrel nut notch aligned with the gas tube port. No torque wrench needed. As for weight savings, the Hogue midlength tube, with its integral barrel nut, weighs 9.9 ounces on my postal scale. The APC handguard parts and barrel nut combine to weigh 10.5 ounces. That’s 6 inches more real estate to hold onto, plus a rail to attach sights to for only 0.6 ounces added. Of course, adding additional rails for lights, VFG’s, etc will cause the weigh to stack up, as will adding those devices but that’s for each to decide on their own. So how did it turn out? Tune in Monday for the reveal!